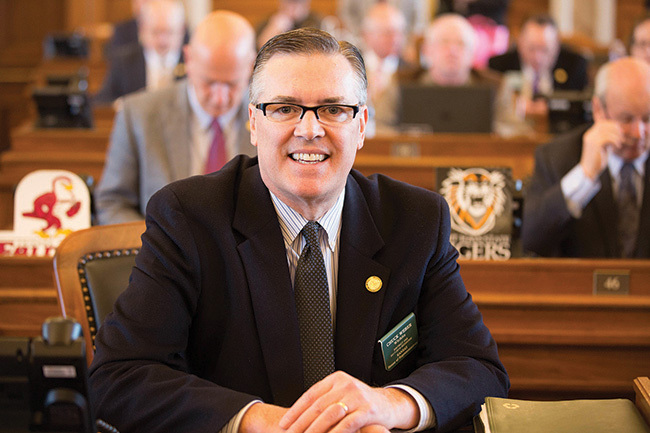 Unanswered questions are dominating the 2019 Kansas legislative session. Conflicting approaches between the governor and the Legislature for solutions to the state’s challenges are creating a sobering political reality. Can you say gridlock? Many core beliefs of Kansas Catholics are trapped in the middle. What will happen in this real-life mystery drama now playing out until early summer? Let’s begin with what we doknow. Any pro-life legislation faces a certain veto. The Kansas Supreme Court is taking nearly two years to decide if there is a right to abortion in the 158-year-old state constitution. Meanwhile, a dozen unborn babies die each week in Kansas clinics by live dismemberment abortion. Are we the Midwest version of New York? Can a public official not enforce the law? Quality health care access for the poor, a critically important Catholic issue, faces fresh questions about unintended consequences. Doctors prescribe painkillers to Medicaid patients at twice the rate of others, who then suffer three to six times the risk for overdose. With low reimbursement levels, will there be enough doctors willing to treat thousands of new Medicaid patients? Will new Medicaid patients “crowd out” existing ones? Do Kansans support increased public funding for contraceptives and abortion-inducing drugs? Will tax dollars be dedicated to “gender reassignment” surgery or therapy? It’s happening elsewhere, why not here? Catholics sacrificing to support two educational systems — their parish school anda neighborhood public school — wonder about poor families and theiropportunity for educational excellence. Will more public money change the negative outcomes of so many students? Is there the political will to reform the predatory payday loan industry? Rural Kansas is disappearing before our very eyes. Can we elevate the family and revitalize the Kansas beyond our cities and suburbs? Troublesome questions, but no less troublesome than this. We yearn for prosperity, yet we must ask: What does authentic prosperity look like through the Catholic lens? Is our idea of prosperity now reduced to the strength of our Wi-Fi connection, the comfort of our home or the quality of our car? Or is there something more, something deeper? Life, marriage, children and families matter. So does our neighbor. The freedom to not just worship, but boldly and audaciously live out our faith in the world matters. Elected officials have difficult jobs. Talk to them. Pray for them. They need wisdom, courage and integrity.